Red Rhino is a cloud-based electrical estimating tool for contractors, which aims to provide users with the tools to create accurate estimates whether in the field or in the office. The fully integrated system offers modules for estimating, biling, project management, and purchasing. Electrical contracting businesses can utilize Red Rhino to automate time consuming tasks with data from estimates synchronized across purchase orders and customer bills. With Red Rhino, businesses only need to enter data such as customer information, project details, labor rates, and material specifications once for each job, when creating an estimate, and the data is then stored within the system for future use. Data can be transferred and accessed by estimators, field workers, project managers, purchasing agents, and any other personnel involved in the project, and as Red Rhino is a cloud-based system it can be accessed from anywhere via a web browser. Estimates can be created within Red Rhino using wizards and assemblies. Wizards are pre-configured estimates for installing a range of items including conduits, alarms, generators, and more, whilst assemblies can be used to input all the material needed for certain projects. Assemblies can be saved and re-used for common projects so that estimates can be created without the need to re-enter items individually. Red Rhino also offers modules for purchasing, billing, and project management, and features including proposal generation, purchase orders, change orders, contract billing, time and materials billing, and project tracking. Project progress can be monitored using Red Rhino and the real-time financial data can be used to ensure projects remain within pre-defined budgets. Throughout each project time and materials can be tracked, allowing users to generate bills for customers in just one click once the project is complete, and invoices can be automatically generated and sent to clients to request payment. Great for small electrical contractor.Has all the features and usability for general projects. Easy to use, with many additional features such as purchase orders, invoicing, change orders and project tracking. Contact Red Rhino for multiple license discounts on more than 4 licenses. Generate estimates within Red Rhino with an in-built catalog of materials and labor costs, including pricing for thousands of items, so that users don’t have to search for item prices themselves. Generate bills by contract specifications or by time and materials, and generate invoices automatically whilst in the field in order to speed up payments. 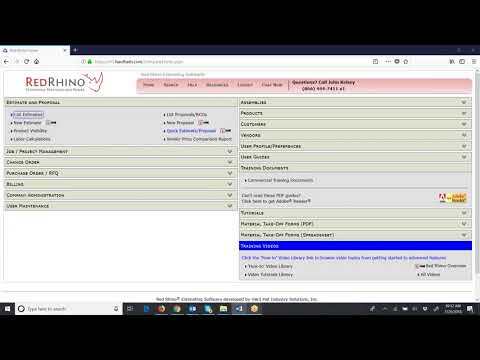 Track time and materials using the Red Rhino system by getting field contractors to input data whilst on the job, and generate bills and invoices based on this data. Manage projects and track the progress of projects within Red Rhino. Benefit from project management tools such as change order generation, work authorizations, and financial tracking and reporting. Use wizards and assemblies to create estimates, with pre-configured wizards for a variety of different items, and assemblies of materials for common job types. Estimate residential electrical, commercial electrical, industrial electrical, fire alarm, and structured cabling. Below are some frequently asked questions for Red Rhino. Q. What type of pricing plans does Red Rhino offer? Q. Who are the typical users of Red Rhino? Q. What languages does Red Rhino support? Q. Does Red Rhino support mobile devices? Q. Does Red Rhino offer an API? No, Red Rhino does not have an API available. Q. What other apps does Red Rhino integrate with? Q. What level of support does Red Rhino offer?